Imagine a world where music is forbidden. Now imagine you’re a child who discovers what music is. It travels into your heart and soul and fills a void you didn’t know was there. But you’re told that it’s wrong. It’s bad. It’s not allowed. Seven-year-old Sonam lives with her family in Kabul, Afghanistan. She wants to play and run, but she must work. She finds solace in a garden filled with mulberry and pomegranate trees, where she meets an old man who plays music. He teaches her that music is everywhere, but to hear it you must listen with all your heart. As she works, Sonam begins to hum music and play the instrument gifted to her by the old man. She finds joy and happiness. But when Sonam’s brother finds the instrument, he takes it away, and Sonam’s spirit cracks. When planes and rockets and gunfire fill the skies, Sonam’s music stays silent. She wonders if her heart will ever open again — if it’s possible to find joy and happiness while surrounded by destruction. Sonam and the Silence is a powerful story about courage. It’s about curiosity and love and a child’s right to question and challenge things. It’s also based on truth. In 1996, when the Taliban took power in Afghanistan, music of any kind was banned. Six years of silence followed. It was devastating for the people. Author Eddie Ayres discusses this at the conclusion of the story in the 'author’s note'. He asks the reader to think about what it might be like to live without music, or something else cherished by your community. What would you do if you couldn’t do something you loved? How would you cope if you had to tell your loved ones to stop enjoying something because it was forbidden? The messages weaved delicately through this picture book are powerful and important. They invite readers to think about the struggles of other people, to imagine life in other countries, have empathy for others and be thankful for their own fortunes. The writing is beautifully addictive. Filled with image-evoking descriptions and poetic language, there are so many sentences that linger in your mind. Her world is so noisy, but it feels so silent. The music drifts away like the clouds. The illustrations, too, are exquisite. With deep colours, textures and layers, filmmaker and visual artist Ronak Taher brings pure magic to the pages. These are illustrations you will want to run your fingers over every time you turn the page. This is a book filled to the brim with striking artwork. 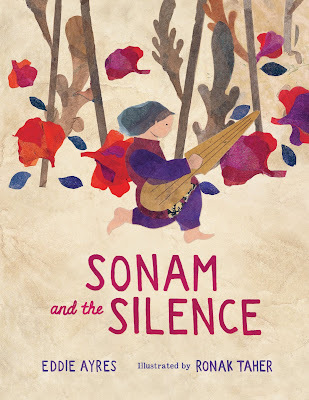 Sonam and the Silence. Powerful, emotional and stunningly beautiful. A picture book not easily forgotten.